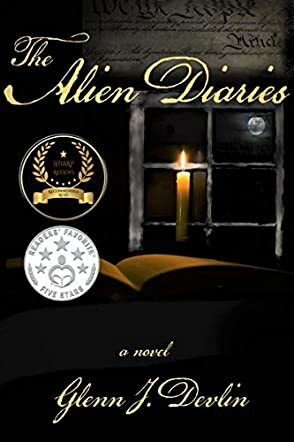 The Alien Diaries by Glenn Devlin is the gripping and fascinating tale of widowed book collector Colin Brayton, hired for a highly lucrative project of appraising an 18th century library, and no-nonsense Maddy Prentice, appointed his supervisor by the generous, yet enigmatic tycoon Asher Bradford. What begins as a quaint mission, with some annoyingly eccentric but seemingly innocuous parameters, gradually transitions into an eye-popping voyage of discovery, as Colin discovers a diary that chronicles events and technologies that should not have been possible in the 18th century. He and Maddy must get past their standoffish relationship, as the revelations contained in the diary quickly spiral into a chilling and perilous scenario. From the get-go, Devlin had me compulsively turning the pages with his touching and poignant prose. The characters are very real and human; I could feel their pain, their fear, and their excitement. The mystery of the diaries is steadily and cleverly developed, with new clues and revelations popping up in unexpected places, and I found myself grappling as much as Colin and Maddy to make sense of the bizarre situation in which they find themselves. While some of the characters’ behavior is perplexing and perhaps a little lacking in credibility, The Alien Diaries is nonetheless a very compelling story, and a thoroughly enjoyable one. The quality of writing is excellent. It’s a science fiction adventure with heart and humanity, blending history with futurism; it is a thriller, a mystery, and a human drama all rolled into one, making for highly entertaining reading.